Members of the BHA UN, have successfully implemented two Model UN sessions as an integral part of the curriculum of an undergraduate course “Multilateral Diplomacy and International Organizations”, instructed by prof. dr. Kenan Dautović and asst. Jasmin Hasanović, Faculty of Political Sciences at the University of Sarajevo. 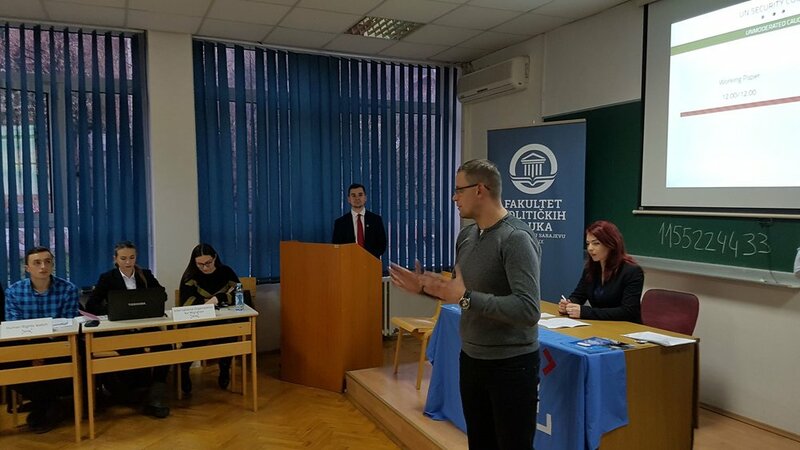 The Model UN sessions were organized for 2nd year students that are enrolled in the course “Multilateral Diplomacy and International Organizations” at the Faculty of Political Sciences at the University of Sarajevo and held in two different occasions (December 4 and 11). These sessions provided the students an opportunity to engage in a simulation of formal proceedings of the United Nations’ Security Council on the topic of “Question of Peace and Security in Syria”. Furthermore, all 32 students of an undergraduate course “Multilateral Diplomacy and International Organizations“ were invited to attend preparatory training sessions. At training sessions, participants were provided with the necessary information pertaining to the Rules of Procedure, needed skill-set for successfully producing a Resolution and voicing national policies, and information related to formal proceedings and formal language used in UN Security Council. During the two formal sessions, students have shown a remarkable progress in the ability to engage the topic at hand, critically asses the situation pertaining to peace and security in Syria and connecting region-wide implications of the ongoing conflict in Syria. After hours of extensive debate, hard work, lobbying and negotiating, the simulated UN Security Council passed a Resolution with unanimous support. BHA UN is satisfied with the outcome of these two Model UN sessions as it provided undergrad students of the Faculty of Political Sciences majoring in International relations and Diplomacy a necessary platform to transform theoretical knowledge in action, while simultaneously allowing students to argumentatively voice their stand. These Model UN sessions provided students an opportunity to learn more about the United Nations and to apply their already existing extensive theoretical knowledge into action. The Model UN participants were required to familiarize themselves with the Study Guide prepared by Sarajevo Model UN Secretariat, Rules of Procedure and to acquire general knowledge of the United Nations’ Security Council proceedings. During the final break before the Resolution was adopted, participating students had a pleasure to listen welcome remarks delivered by Vice-Dean for Student Affairs at the Faculty of Political Sciences, prof. dr. Mirza Smajić who commended the participating students’ hard work and dedication. The BHA UN is thankful to prof. dr. Kenan Dautović, asst. Jasmin Hasanović, Head of Political Science Department, prof. dr. Elmir Sadiković and Vice-Dean for Student Affairs, prof. dr. Mirza Smajić for hosting us at the Faculty of Political Sciences at the University of Sarajevo and BHA UN is looking forward to furthering the existing cooperation in the future.